Inspecting spinach leaves, or spinach plants is a fairly easy, but a time consuming inspection. First off, there is a U.S. Grade Standard for Spinach Leaves, and there is a U.S. Grade Standard for Spinach Plants, with subtle differences. If you were to follow the grade standards, when inspecting spinach leaves your sample size would be 100 leaves. Yes, you would have to count out 100 leaves for each sample. Each defective leaf would equal 1%. When inspecting spinach plants, your sample size would be 5 pounds. Yes, you are expected to weigh out 5 pounds of spinach plants. If you find a few plants with decay, the entire plant is defective, even if the decay is only affecting one leaf on the plant. Weigh all defective plants, and divide by 5 pounds (80 ounces) to determine your percentage of defects. But we are not done. 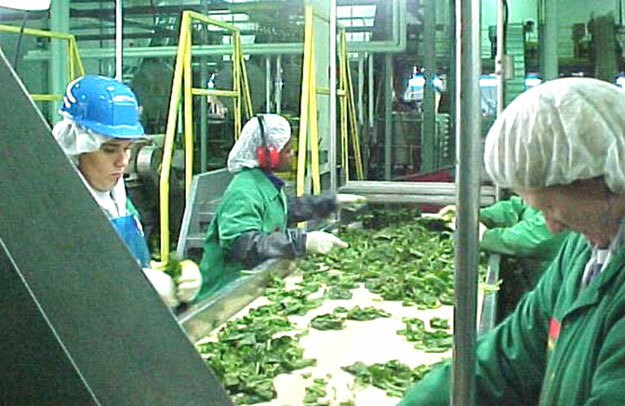 If you are inspecting spinach plants, but they are bunched, then you would have to use the U.S. Grade Standard for Bunched Spinach. Incredibly, spinach has three different grade standards. When sampling bunched spinach leaves or bunched spinach plants you would count out the number of bunches in the carton. Usually you find 2 dozen bunches in carton. 24 bunches would be the sample size. If you encounter a bunch with a defect or decay, even if the defect is only affecting one leaf of the bunch, the entire bunch is set aside as the defect. 1 defective bunch would equal 4%. The defects are common for all three standards, as you would look for discoloration (yellow leaves), broken leaves and decay. The tolerances allowed are a bit different. For the bunched spinach, the tolerance for total defects is 12% and not more than 3% is allowed for decay. For spinach leaves or spinach plants, the tolerance for total defects is only 10%, and not more than 1% is allowed for decay. Barbara, thanks for your question. You are correct, the USDA does not have any specific scoring guidelines for crushed and broken leaves, only if the defect materially affects the appearance of the leaf. The USDA will score the leaves as a defect if they are broken, or watersokaed/discolored due to bruising or being crushed. Thank you! Would you look at bulk baby arugula in the same way? I inspect that a lot and feel 100 leaves is too small of a sample. It is such a sensitive product.